Hi everyone, I have had to take an unplanned bit of time off from blogging and all. Sometimes life can become a bit chaotic. I have been working four days a week at a women's clothing store here in our little town. Health issues have led to exhaustion, and painting and drawing has slowed down. Not stopped thank goodness! The health issues are being addressed and will take a bit of time but I am happy to be on the path to wellness. This is a transition time in my life (again!). Issues like these always come up in our lives to give us a chance to stop and think and to hopefully take positive action. It has been a busy summer in many ways. Summer is the time for many in our little town to make enough income to survive the slow stormy winters. The store I work in is one of these and our summer has been very busy indeed. Summer is also a wonderful time for the band I am in as we play a lot of outdoor gigs. We will be playing at the local Farmer's Market next Friday. I love going to our little Farmer's Market where I stock up on veggies and fruit for the week. This week I also picked up a bunch of sweetpeas, a bottle of flower essence, and a tin of lavendar shea butter for my hands. All locally made and crafted. There is always music too and I like to sit and sketch after I get my marketing done. 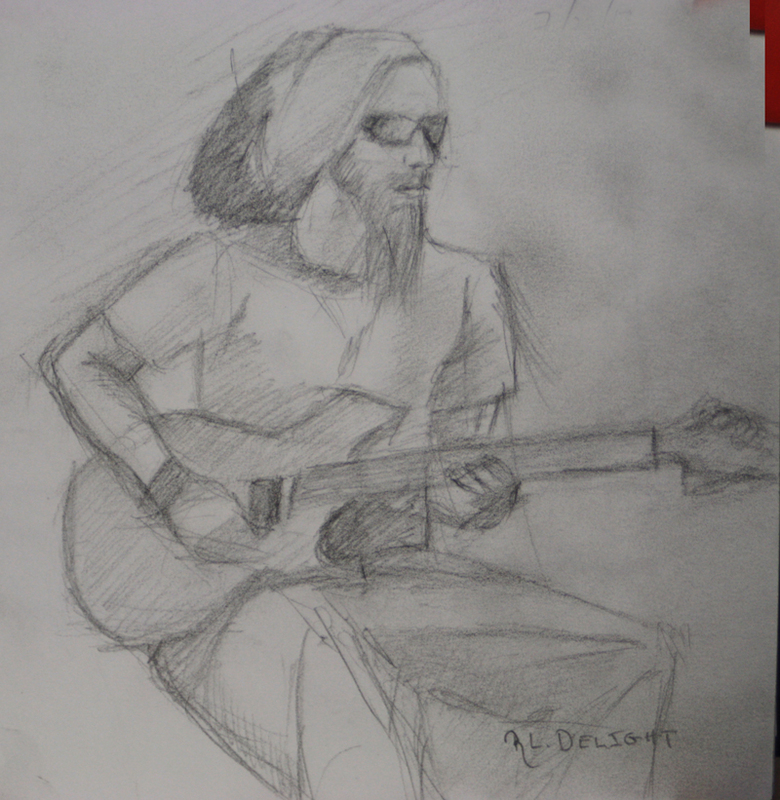 Here is a quick sketch of a musician friend playing at the market. ©2013 R.L. Delight, Farmer's Market Sketch, graphite on paper. 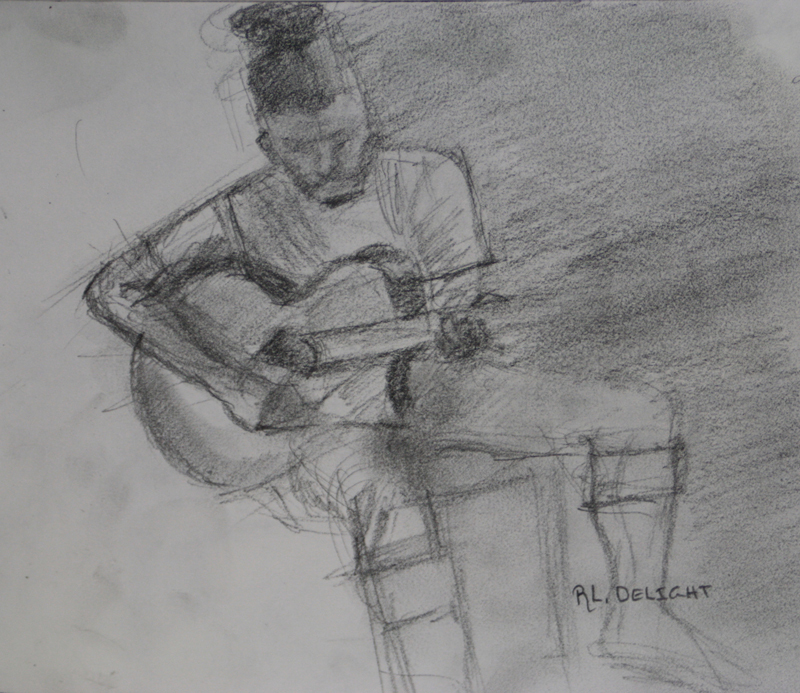 And another quick sketch of his musical partner when they were playing at the opening of The Beehive, a local tea and coffee hang out. ©2013 R.L. Delight, At the Beehive, graphite on paper. I love filling my sketchbook with people and places. It is a relaxing habit to have as I make no expectations on these sketches. They are meant for practice and for my own enjoyment so I only occasionally share them with others. I have sad news to share too. Our beloved and beautiful dog Twill is now 13. She has had problems walking and had to be carried into the house on Monday evening, in spite of ramps. We took her to the vet the next day and found out that she has an advanced case of bone cancer in her hip. There is not much we can do but make her comfortable and lavish her with love over the next few weeks. She is on medication for pain and has perked up. She is able to still go on walks and sniff the smells as well as get into the occasional bit of mischief. I took this picture a couple of days ago. I walked her down to the beach. 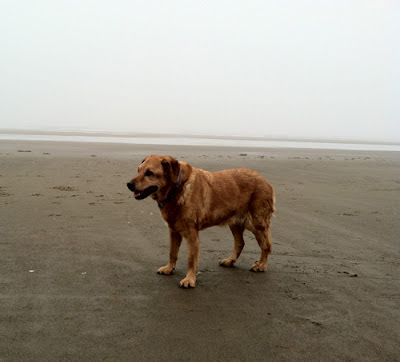 It will probably be her last time on the beach as the sand is really hard for her to walk on. She ate a lot of things she found so we headed back home. We knew she was approaching the end but we are going to miss her. Until then we make her comfortable. She is a joy. 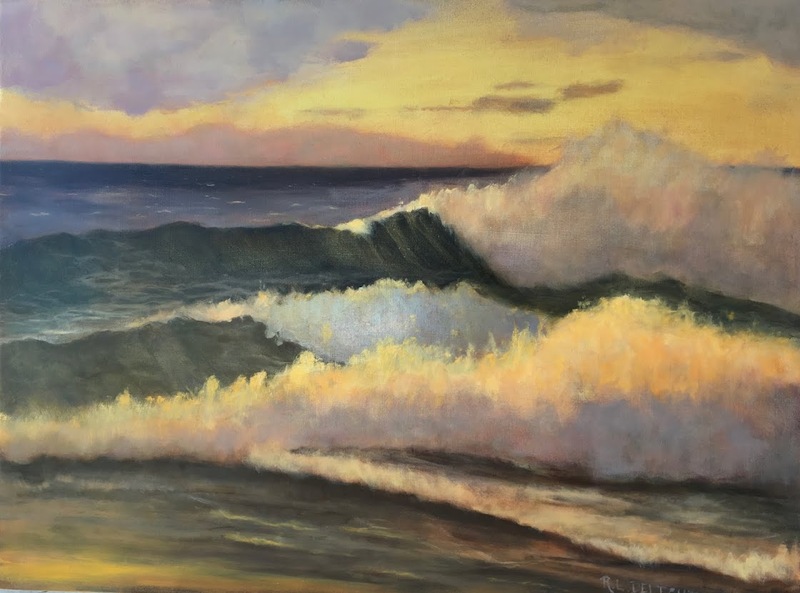 I have plans to get back to wave painting when the fall storms arrive. I even have new foul weather gear! Until then I sketch and continue to slowly work in the studio while healing. I will try not to go away for so long from the blog too! Oh Renee, I'm so sorry about Twill. She is such a sweet dog and good friend to you and Bob. Its so hard when our beloved pets age. I am sorry also that you haven't been feeling well. I hope you will mend quickly. I hope you get to feeling better soon and that you are enjoying your precious time with Twill. Thank you Dana and Katherine!